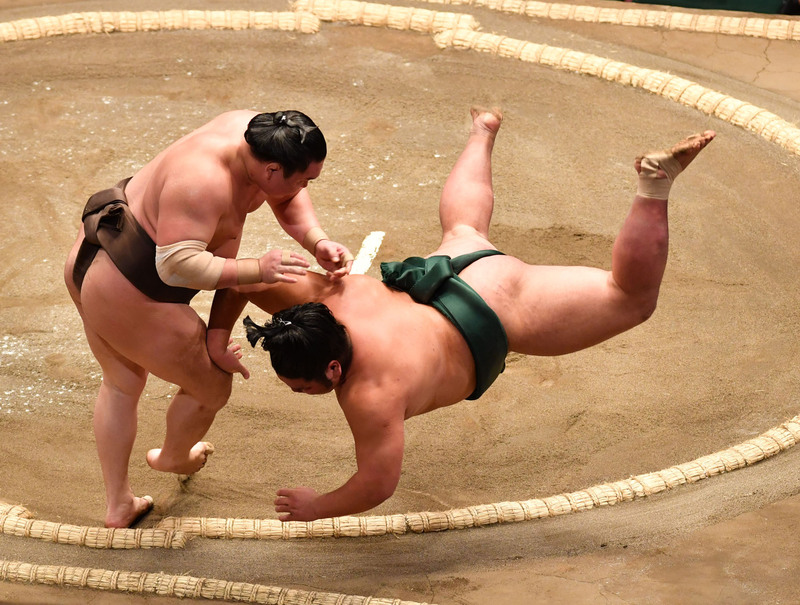 Hakuho continued his run of narrow escapes in the first week of the New Year Grand Sumo Tournament, surviving two more close calls Thursday to retain his share of the lead on Day 5. The yokozuna’s win over previously unbeaten No. 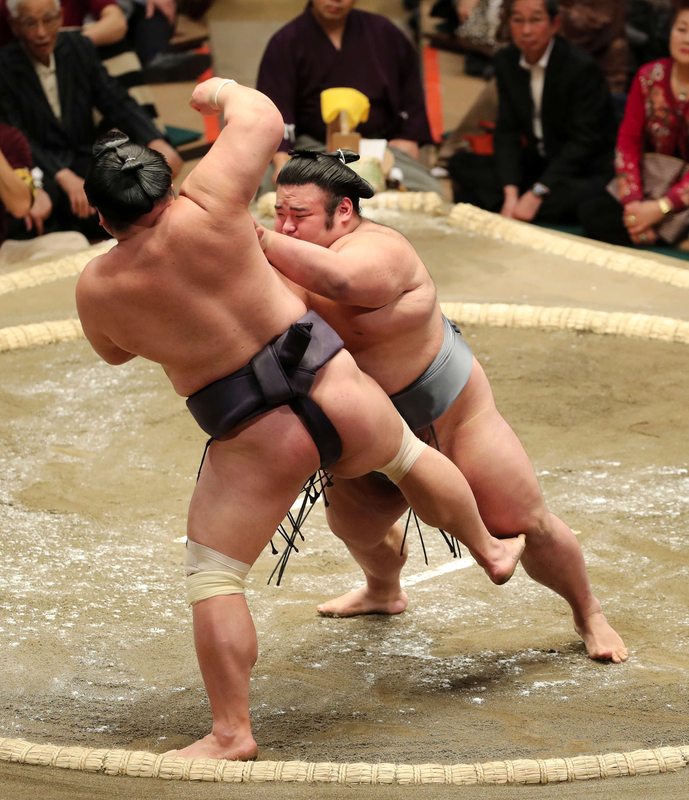 2 maegashira Nishikigi kept him in a four-way tie for the lead in the 15-day event at Ryogoku Kokugikan. Komusubi Mitakeumi, No. 6 maegashira Onosho and No. 8 Kaisei also ended the day with perfect records. Hakuho was ordered to refight his match when the ringside judges overturned the referee’s original declaration that Nishikigi had won. 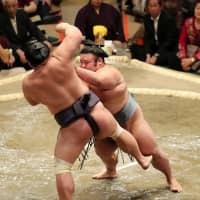 In the rematch, Nishikigi got the better of the opening charge and found himself pursuing the yokozuna around the ring. With Hakuho’s heels nearly up against the straw, Nishikigi lowered his right shoulder for a charge into the yokozuna’s midsection. 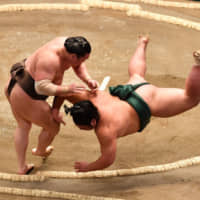 But the 28-year-old telegraphed his move, and though he knocked Hakuho out, the yokozuna was able to execute a perfect overarm throw to send Nishikigi over the straw first. Mitakeumi received the charge of sekiwake Tamawashi, who stumbled into a hornet’s nest of slaps, shoves and thrusts. Before he knew what hit him, the Mongolian was being driven back the way he came and out of the ring to his second loss. A komusubi following a 7-8 mark in November, Mitakeumi is looking to rebuild his credentials here for another run at promotion to ozeki. November champion Takakeisho (4-1), also seen as a future ozeki, shook off Wednesday’s loss to Mitakeumi. The sekiwake attacked with a high-energy combination of slaps and thrusts to propel komusubi Myogiryu (1-4) backward over the straw bales. Yokozuna Kakuryu (2-3) repeatedly failed to finish off 226-kg Ichinojo and was eventually forced out. Ichinojo pushed the yokozuna back to the straw twice, only to see his countryman wriggle his way to safety. But Kakuryu could neither lever his opponent out nor tip him over. The yokozuna appeared exhausted by this exertion and eventually had no answer for Ichinojo’s bulk in their 36.3-second struggle. Ozeki Takayasu suffered his third defeat of the tournament. Takayasu created openings for himself against No. 3 maegashira Shodai (2-3), but lacked the balance and strength needed to finish it and was eventually tipped over at the edge of the ring. After Takayasu’s loss, No. 3 Shohozan was handed a win by default after ozeki Tochinoshin’s withdrawal earlier in the day. That left it to winless Goeido to salvage the day for the ozeki rank, and the 32-year-old delivered. Goeido (1-4) expertly forced out No. 1 Tochiozan (1-4) on the opening charge, snapping up a belt hold while barely breaking step as he carried his opponent to the edge and forced him over.